This article describes how to use MonitorWare Agent to monitor NetApp devices using the backup .evt files. In this guide we describe how to setup the service. For creating the actions, please refer to the our other guides. There are basically two methods to monitor logs of NetApp devices. The first, described here, is to monitor the .evt files that the NetApp device generates. 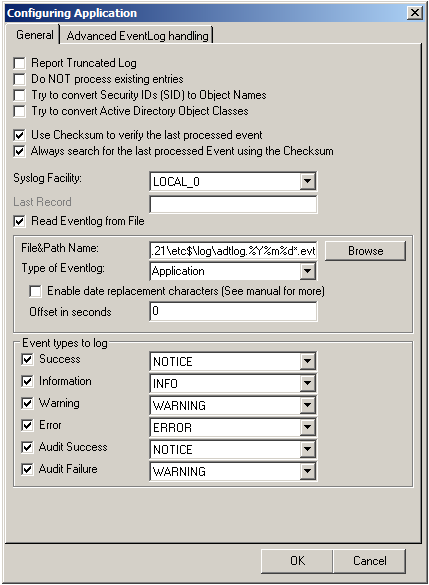 The second method is to monitor the device via the Eventlog API. Instructions can be found here. The NetApp device basically offers to access the .evt files via a network share. Thus the files are easily accessible through our products. Basically, we need to create the Event Log Monitor service in MonitorWare Agent. Simply right-click on services and from the popup list, choose “Add Service” and the “Event Log Monitor”. Now disable all the currently available logs except for one. Double click on the one that is still checked. A new window opens. In this new windows, enable the option “Read Eventlog from File”. The parameters belonging to this option are now available. Insert the file and path name into the field. Alternatively, you can use the browse button to navigate to the remote location of the NetApp and choose the file like that. You could now also change the “Type of Eventlog” if necessary. Please note, that this method is also fit to monitor multiple files. You only need to change the file name accordingly and insert wildcards to replace name values like dates. This is good for cases, when a new log file is created every day and the filename reflects the date when the file was created, like below for file like adtlog.20130206110000.evt or adtlog.20130206121314.evt. So thats it basically. You can now choose to forward the log messages via syslog to a central log host, write them into a database or use one of the many other options that are available in MonitorWare Agent. This entry was posted on Wednesday, May 15th, 2013 at 13:11	and is filed under Services related, Step-by-Step Guides. You can follow any responses to this entry through the RSS 2.0 feed. Both comments and pings are currently closed.